Whilst detailed information is hard to pin down, Aimé Guerlain is credited with the creation of Guerlain's Cuir de Russie in around 1875, making it one of the world's first olfactory interpretations of Russian Leather; a theme that would be revisited many times by many perfumers in the late 19th century, and appear again and again well into the 20th. In order to explore the idea behind this perfume, lets take a brief look at what was happening in Europe at that time. By the late 1800's, internally, industry in Russia was booming and the middle class grew in number and influence, though unfortunately, in part at the expense of the peasants. As a result, revolutionary tensions were at hand. Externally however, Russia was an untouchable flourishing powerhouse whose intervention in the Balkans against Ottoman rule had clearly illustrated to the rest of Europe, their colossal strength and spirituous resolve. Russia was looked upon in envy as a glittering empire, despite her volatile political climate on the interior. At this time of military engagement, it has been suggested that Aimé Guerlain was inspired by Russian military leather boots when producing this perfume, as Russian leather is distinguishable by its unique odour. Traditionally, real Russian leather is tanned with bark from the willow, larch or poplar trees, and then rubbed with birch-tree bark oil. The scent profile is very distinctive. Guerlain's Cuir de Russie opens with what feels to me like bergamot, orange blossom, and perhaps galbanum; an enchanting flight which is citrusy, floral and slightly green, but reservedly so... it tapers away rather swiftly before a dryness begins to swell from beneath. A thin grey ribbon of smoke meanders up from the heart of the perfume and brings with it a very parched sensation. It feels as dry as a dusty coal mine, with a fine black curtain of soot shifting on the air. I also recognise a very smokey tarry birch accord which is quite bitter, in keeping with genuine Russian leather style. It is somewhat animalic - I wouldn't be at all surprised if there is a tiny huff of civet present, though it is paired well alongside the rich leather facets. What I also find remarkable, is that whilst the "cuir" aspect is quite commanding, the perfume still remains a little transparent... one is not overwhelmed with the dizzying aromas of a smoke cupboard or tannery. It manages to tippy-toe the fine line between being defiantly feminine and devoutly masculine. Cuir de Russie has remarkable tenacity. As it lingers on the skin, I feel a shift from the smokiness of the leather to a rather lovely camphoraceous chypre base of dry vetiver and oakmoss... what I would call a 'signature' Guerlain treatment. Here one begins to garner a sense of the opulence and romance of the Russian empire; the gilded halls of the Winter Palace in St Petersburg, or the patterned spires of St Basilis on Moscow's Red Square. 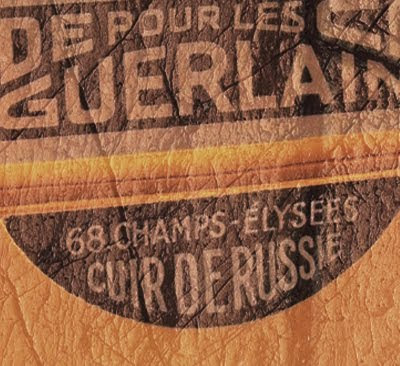 Aimé Guerlain not only succeeded in capturing the essence of Russian leather in his Cuir de Russie creation, but also memorialized the essence of that age. This is on my list for 2011 . I always thought I'd be nauseated by leathers but my Cuir de Lancome didn't do it and I adore Armani's Cuir Amethyste . What a lovely explanation! I loved it very much! In Haiti, the boots were treated during the first invasion by American troops with what is called in the island as "shoublack" just a way to say "shoe black" which is the hibiscus, and it gives a certain particular scent to the boots leather, giving them shine. Just something I wanted to share here. Since leathers have become a passion, I'll be keeping an eye out for this little gem. Wish me luck!